Stoughton Hearts & Voices Community Choir – www.facebook.com/Stoughton.Hearts.Voices – every Wednesday (check in advance as occasionally I’m away), 7.30-9pm, £5 per session at the QE Park Centre, Railton Road, Stoughton, Guildford, Surrey, GU2 9LX. Contact stoughton.hearts.voices@gmail.com or text 07739 321158. 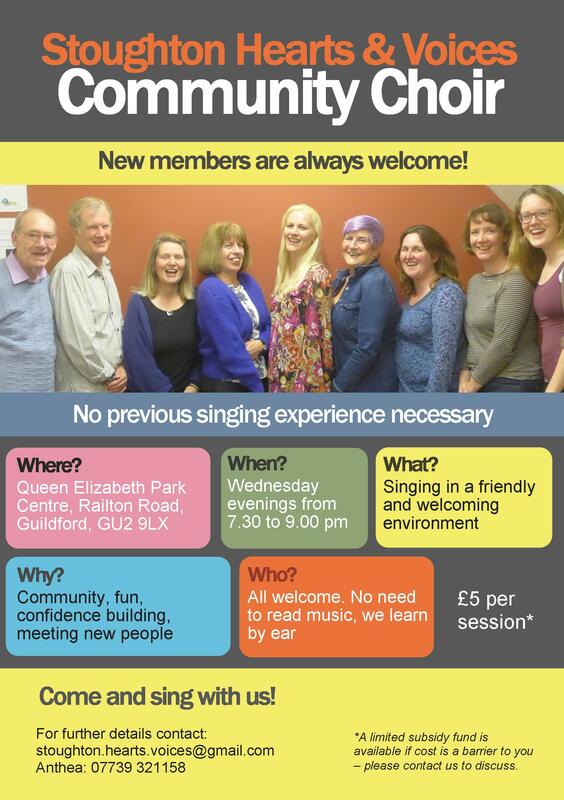 Stoughton Hearts & Voices Community Choir (open to everyone, not just Stoughton residents) runs every Wednesday evening, 7.30-9pm, at the QE Park Centre, Railton Road, GU2 9LX. We’ve been running since January 2015 and the group is really friendly and welcoming. Our aims are community, fun, wellbeing, getting to know new people and sharing the uplifting experience of singing together. All songs are taught by ear, so you don’t have to read music, and no previous singing experience is necessary. The choir is led by Anthea Prince – freelance community musician and instrumental/vocal teacher who is also a local resident – and the atmosphere is informal and relaxed. Sessions are £5 each – but do contact Anthea if you’d love to come along but finances are a barrier, as there may be some subsidy funding available. You don’t have to come to every session, you can come along whenever you’re available. We occasionally perform – but it’s not compulsory to take part – and we don’t take part in competitions. Occasionally there is the odd week when Anthea is away so the session may not happen that week – so new members are encouraged to get in touch in advance to check. 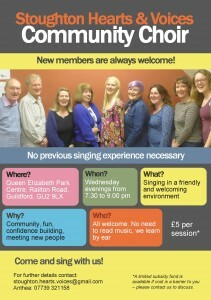 Please note that the Guildford Carers’ Choir project which Anthea was leading at the Park Barn Centre is not currently running, and the Weybridge Carers’ Choir which Anthea was leading is continuing in a different form with Elmbridge Borough Council staff (please contact the Weybridge Centre on 01932 844391).